‘St. Nicholas’ at Goodman: Drama critic meets vampires. Seriously. He’s bloody amazed, too. It turns out vampires are real. Who knew? Anyway, the veracity of vampires is the central proposition of Conor McPherson’s one-man play “St. Nicholas,” now meandering across the boards at Goodman Theatre. 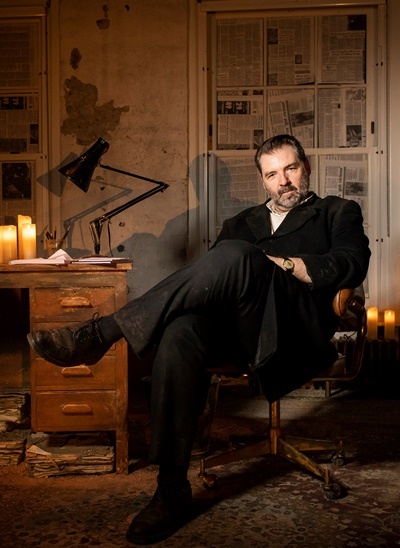 I suspect the greatest allure of this dubious enterprise, brought to Chicago by London’s Donmar Warehouse, is the presence of Brendan Coyle – yes, the same Mr. Bates of “Downton Abbey” – as the nameless monologist. I’m not about to spill the blood – sorry, beans – about how the narrator survives his close encounter with vampires. Honestly, I think it’s no more remarkable than my own survival of this leaden play and Coyle’s painfully mannered recitation. And that I will freely and amply share with you. 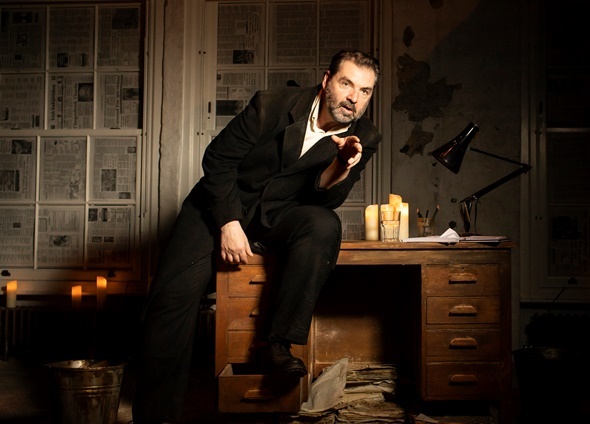 Brendan Coyle, as narrator, reflects on the remarkable experience of meeting vampires. If the character Coyle inhabits has no name, he does have an identity: He’s a veteran theater critic, as vain and cynical as he is world-weary and alcoholically embalmed. But he is not actually dead, mind you; nor is he a vampire. At least, he appears to be hale and quick even to the end. It’s possible our critic’s entire saga is the concoction of his imagination – a bad dream, a theatrical fantasy, the effect on the brain of too much booze. Yet I’m inclined to take it all at pale-face value, as if his wild tale is the chronology of actual events. He has consorted with vampires and indeed even colluded with them – to provide the sustenance they require to fulfill their eternal lease of life, if that is the correct word for their condition. But dear me, it does take the longest time and the most circuitous narrative path for your man finally to sink his teeth into the substance of his yarn. The play unfolds in two acts of roughly equal length – that is, in like portions of longueur. Act I is a sort of shaggy-dog autobiographical ramble. We learn about the critic, the terror he can inspire in the prospective victims of his pen and the perverse glee he takes in strutting through life as this dreaded demigod. I would have been OK with the playwright’s amusingly outrageous story-line had I not kept losing sight of it in Coyle’s self-consciously precise stage maneuvers and his relentless histrionic pauses mid-sentence. I became aware of the actor’s well-honed mannerisms quite early on. I might have said I became conscious of those affects except that I swiftly sensed myself turning semi-conscious. As Coyle strode about the stage, righting an overturned chair here or whirling suddenly into casual rest upon a desk top there, the impression was less of spontaneity than of stolid habit. 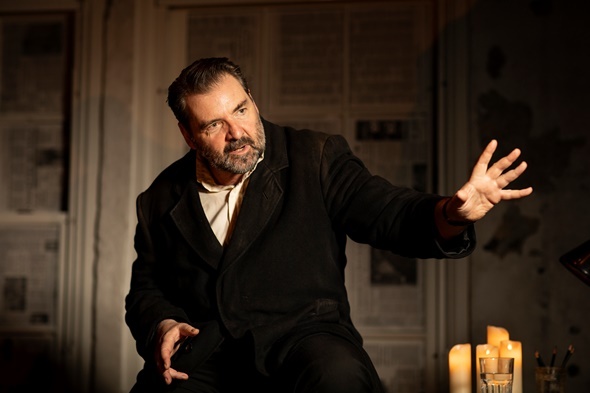 In his monologue, Brendan Coyle gave vampires a charming whiff of plausibility. Repeatedly in the expository first act, playwright McPherson sends his poor narrator off on garrulous tangents that feel like grand staircases that go nowhere. By intermission, I envied the few patrons who, clutching their coats, shuffled toward the exits. I remained with the many who returned for Act 2 – and the new vista of a stage ablaze with lighted candles. Now the narrative would draw us into the world of vampires. Coyle, his penchant for pregnant pauses notwithstanding, is a master story-teller, an imposing figure who commands attention physically as well as verbally. And his account of meeting vampires and habituating himself to them carried a charming whiff of plausibility. At first glance, the narrator explains, a vampire looks like anyone else – like a real person. Upon closer inspection, however, differences betray themselves: in their eyes, their pallor. Our raconteur also observes that, in what amounts to a vampire dormitory, there’s no food to be found. Not a bite. That’s where the boozy critic becomes useful. Still, the wordiness of McPherson’s play confounds it fore and aft. Where the first act wanders, the second part turns redundant and thin, and finally hollow in a closing homily about the power and truth and human commonality of – wait for it – love. This from a cynical, curmudgeonly narcissist. In this show, love is just a four-letter word. Like bite.